These descriptions use the traditional Futhark order with the exception of placing Fehu at the end. With the runes placed in a circle, the end is also the beginning. 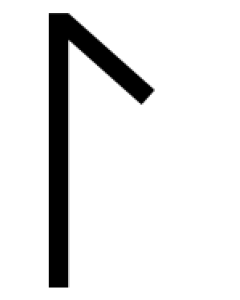 I first saw this used in Kenneth Meadows book, Rune Power. It just felt right to me; to view the order of the Runes with this circular perspective. The Runes and their meanings are drawn from nature and nature is circular at its core. It is from this repetitive circle (spiral) that our lives flow and evolve, so it only makes sense to apply this to understanding ourselves. Let us walk this path with awareness and intention together, in Love. The beginning of all beginnings. There is a unique energy required to do that which has never been done before and to begin our lives again, again and again. It is a powerful and persistent force. The strength to do this is inherent because we are eternal beings, made in the image and likeness of our eternal Creator and Source. We begin again and again. 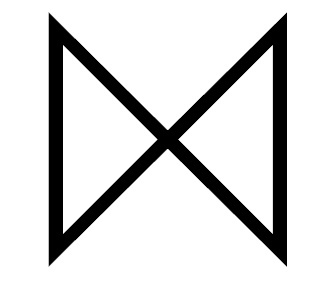 So know that you have the strength to start each day (or project) anew when this Rune comes to you, and be grateful for your Eternal Source of strength and love. Go ahead and get started. With the strength and endurance provided for us in Uruz, we now do one of our primary jobs for our soul development, our reason for being. Thurisaz represents Thor's hammer and we use it to clear away the things that do not serve our highest good. We are very creative beings and in our world today we are barraged with all that we have created. We must develop discernment in order to make our way through to find that which serves and supports our Will (the desire for Love) and that which does not (judgement, unforgiveness). From A Course In Miracles perspective, this is the energy to use to develop the insight of our blocks to the awareness of Love’s presence. Thurisaz is a primal and necessary energy that keeps entropy at bay. Without it we would surely self-destruct. It is the energy which assures that good conquers evil. This can be a very disruptive force for we are often attached to those things which do not serve Love. These are the places where we will feel Thurisaz at work. When we embrace the energy of Thurisaz we accept that there is a plan that is working for our highest good, for Love, despite our own worldly wishes and desires. To work with Thurisaz we have to allow vulnerability in our lives and only then will we know that we are safe and loved. Source cannot leave us wanting. This Light will help us see that in this worldly experience we have chosen, it's all about relationship and the GIFT that relationship is. This encompasses all relationships, from the one we have with ourselves and others to the Divine. We must truly understand the gift and blessing relationship is or our lives will be full of angst and sadness. The gift of time accompanies the gift of relationship, for it is time that we spend to develop the relationships. These gifts give us the opportunity to develop trust, for it is in trust that relationships strengthen and grow. This is our lesson. This is what we are here for. As we take the time to focus, it is useful to learn how to entertain the STILLNESS, if we are to know the Truth of our being. We are not the disruption, it is only an experience. The Soul longs for the peace & quiet, for that is where we come to truly know ourselves. Learn to embrace the stillness and resist the tendency to move on before you are ready. This will possibly help in future disruptions, if you allow the pace of the Universe to just be. When life gets too crazy all around us, we must intentionally be still. This is the purpose of meditation. Practice this so you can call on that Peace when you need it. When we become still, we can discover the natural cycles of everything all around us. For everything there is a season. As we learn to flow with the cycles from the time to plow to the time to rest, we will experience the harmony and peace of our world. We will also come to know the rhythm of our own lives. Learn to understand the necessary ingredients for each phase of life. Sometimes it’s rest, sometimes it’s preparation, and sometimes it’s just plain work. As we stay focused and patient, we will grow abundantly. Do your work and trust the bounty will come. Source does not leave us wanting. When we know that we are One, safe, loving and loveable, we cannot but help to heal and discover our True Destiny. We are called to surrender and embrace this destiny, which can only bring us joy and fulfillment. It is provided for us but we must take the journey on. We are required to participate and choose the way we go. This is where we employ our free will. When we participate through listening to our heart and to the wisdom within and without, we find our lives are rich and rewarding. When we feel rich and rewarded, we give back to those around us, because it brings us joy and we find the Way. When we truly embrace our destiny, we will become the Spiritual Warrior that we are meant to be. We must stand for and BE the Truth we have been given and come to know. We can only be true to ourselves, for we are the only ones who know our OWN truth. This often calls for courage and faith, and that is the path of the Spiritual Warrior. When this Rune comes to you, know that you are being called to stand in your Truth. Do it with conviction and courage and you will show others the way of the Spiritual Warrior. As we walk the path of the Spiritual Warrior, the result can only be one of growth and advancement in our own spiritual evolution. We are supported and guided by the very air we breathe and the wisdom we embrace. "All things are lessons God would have me learn." (ACIM)* If something is before you, it is yours to learn and embrace, be it hard or easy. And we will grow one way or the other. If we refuse, we stagnate and thwart our growth, which goes completely against our God-given nature. There really is no choice but to live, so we might as well do it with love and gusto. When Berkana comes to you, be grateful for your Life. You are a unique and necessary part of the Whole. Embracing our path and evolution in a dance of cooperation, respect and oneness, we grow and blossom even more. 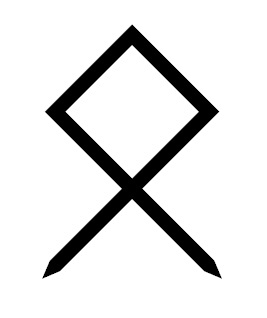 We find connection, balance and satisfaction on this joyful ride we are taking, when we draw this Rune. This connection and balance can become other-worldly as we grow and draw our Destiny to us. We can tap into the ethereal side of Life, which is fascinating and inspiring. We can feel the joy of Life beyond the mundane and the day-to-day reality. Here we embrace the Good, the Holy and the Beautiful. What a gift! From the place of connection and cooperation we build community, embracing the diversity and finding our own role and purpose to play out. We explore and express what it is we do best to serve our community and the world. 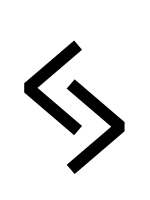 This Rune calls for self-exploration and the acceptance of responsibility for where you find yourself in the world. This is your gift to the world and your community How are you showing up? From this place of cooperation, we work with the abundant and infinite energies of Light, Love, Wisdom and Support. We feed ourselves and each other. We learn to be adaptable where we can and stand firm when we must. It is through this process that we develop our intuition, and we feel nourished and inspired. 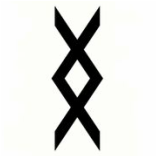 This Rune calls for us to go with the flow, but never at the cost of our own Knowing (intuition). Therefore it also calls for us to examine our choices and intentions. Do it with gentleness, care and love. And if it feels right, take a soak in some water while you reflect. Aaahhh. As you discover your passions and follow your heart, change for the better is assured. Honest work is always rewarded. Blessed transformation is the result and promise. A new day is forever given. Be excited for it. We must never give up hope. Embrace the Love that is given and the Love we give. Here we find fresh air to breathe into a new life. This is not without effort and vigilance, but it also holds the Promise. Be glad. Know that you are loving, loveable and loved and that a new day is here! This is Heaven. Our reward for all our hard honest work, living in integrity, cultivating Love in all we do. When this is how we live our lives, we find peace and joy. Now we are Home, in an abundant and bountiful Universe. We are full of gratitude for all that is given and we share the bounty without hesitation, for we know that is the purpose of bounty. Life is good. If this is not how you feel, look at where you are placing your value. Have you put things that are transitory, weak, or superficial on your altar? For everlasting peace, we must truly value that which is of lasting reward. Look at your heart’s desire to know your peace. Is it real? Is it honest? Only invest in those things that give you true peace. This is treating our Life with the respect it deserves. 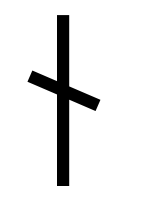 In working with the Runes, some have reversed positions. When this is the case, think about what it would mean to have that energy coming backwards or as blocked? How would that change it? Or in what way do you not want to hear it? Keep working with your layers of resistance to discover the Truth. A really good question to ask almost anytime for any thought or belief; ”Do I know this to be absolutely true?” Play with it and you will learn to know when you have the right answer. I feel that each of these Rune symbols has a gift for us. Many have the qualities or energies I attribute to the Nature of God and others feel like they represent the tools we have been given to know and understand ourselves and God a bit better. I find working with the Runes very helpful and hope that these little definitions I have offered are helpful as well. May you find peace in all that you love.